A new security setting in Google lets users opt-in to allow its tools to use all the information associated with their account — search, YouTube, Gmail, Chrome, Maps, Home — to inform the ads seen across the Web. While Google already does this within its own services, the new service pools data from across the Web and mobile devices. Chrome and Gmail users began seeing notifications Tuesday about privacy updates that will allow them to turn on "relevant" personalized ads. The opt-in option is part of a set of features offered in a new service that Google calls My Activity, an extension of My Account, which lets users "rediscover the things you've searched for, visited, and watched on Google services." The My Activity dashboard provides the user with information on sites visited, time and day, searches, and even detailed directions requested on Maps. The platform aggregates the data from voice searches on mobile and desktop devices that are tied to the Google account. A delete button makes the data Google stores vanish in a two-step option. All this detailed data collected from Google's services across the Web on desktop and mobile devices creates a powerful ad-targeting platform because it not only considers historic information when serving ads, but it will predict future behavior through artificial intelligence and machine learning to offer recommendations. Providing data on historic searches is not new. 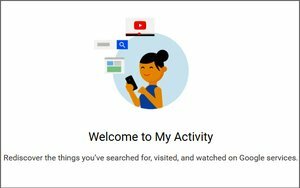 Google launched a service called My Account last year as a hub where users could go to monitor privacy settings and security controls. Voice search tracking was added later.